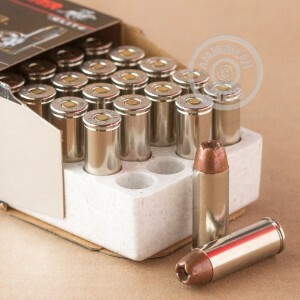 This .45 Colt ammunition brings this classic cartridge up to date with high tech self-defense PDX bullets. 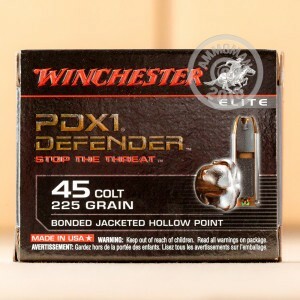 These rounds fire a 225 grain bonded-core bullet with a notched jacket that delivers excellent expansion. At 850 feet per second, this ammo's muzzle velocity is significantly higher than cowboy loads but not so high as to generate excessive recoil. Ideal for everything from the Colt SAA to the Taurus Judge. 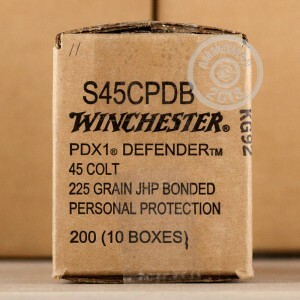 These rounds come in boxes of 20 and are loaded by Winchester in Oxford, Mississippi. They use non-corrosive Boxer primers and brass cases. Earn free shipping from AmmoMan.com with any order over $99!